This study aims to compare the topographic distribution of cortical activation between real and imagined movement through event-related potential (ERP). We are specifically interested in identifying, the topographic distribution of activated areas, the intensity of activated areas, and the temporal occurrence of these activations on preparation and motor response phases. Twelve healthy and right handed subjects were instructed to perform a task under real and imagery conditions. The task was performed simultaneously to electroencephalographic (EEG) recording. When compared the conditions, we found a statistically significant difference in favor of real condition revealed by performing an unpaired t-test with multiple corrections of Bonferroni, demonstrating negative activity on electrode C3 and positive activity on the electrode C4 only in motor response phase. These findings revealed similar functional connections established during real and imagery conditions, suggesting that there are common neural substrate and similar properties of functional integration shared by conditions. Keywords: : Cortical activity, event-related potential, ERP, imagined and real movements. Humans have the ability to generate mental images of perceptual and motor events without requiring any connection to external stimuli, a process known as motor imagery (MI) [1-3]. The MI is a mental simulation that corresponds to a dynamic state during the performance of a specific action internally reactivated in working memory in the absence of any movement [4-6]. Neuroimaging studies show a substantial similarity of the neural mechanisms underlying motor execution (ME) and MI [3-6]. However, a better comprehension of these mechanisms involved in ME and MI requires knowledge of how the brain regions activated co-interact with other regions during a particular sensorimotor task, whether real or imagined. In addition, with the technological advance achieved by neuroimaging techniques in the last two decades, it was possible to identify the brain regions that are activated during ME and MI, for instance, tasks of hand and finger movements, providing a direct comparison between the activated areas in both conditions [5, 6]. According to Jeannerod [1, 2], MI represents the access to motor intention, which can be executed also unconsciously during motor preparation. MI and motor preparation, therefore, share common mechanisms and can be considered as functionally similar processes. As a result, a big overlap of activate brain regions when compared ME to MI have been observed by several neuroimaging studies in the last five teen years [6, 7]. A relevant issue that it has taken into account is the involvement of contralateral primary motor area (cM1) in MI, which seems to reflect a fundamental change about the understanding of functional organization of the motor system. Thus some questions were raised. First, if cM1 were purely related to ME, no activity would be expected during MI. Second, if activity in M1 was observed, possibly would be due to ME not detected during MI. On the other hand, if activity in M1 was observed during MI, even avoiding involuntary movements, such fact might modify drastically the understanding of the M1 function during motor preparation and ME . In this context, in recent years, several techniques have been used to investigate cognitive processes related to motor activity, for example, the event-related potential (ERP). ERP are transient changes in brain electrical activity, recorded by EEG during task performance, in response to presentation of a stimulus or event [9-11]. The examination of event-related potentials (ERP) provides useful insights into the nature, organization and timing of neuronal events that subserve the sensory, perceptual and cognitive processes. Hence, the different stages of sensory information processing are represented by specific ERP components, specifically reflecting the primary and secondary processing of sensory input, encoding, classification and guidance of the task, as well as the selection and response execution . In the current study, we aim to investigate the comparison of the topographic distribution of cortical activation through event-related potential in real and imagined movement. We were specifically interested in identifying specifically, the topographic distribution of activated areas, the intensity of activated areas, and the temporal occurrence of these activations on preparation and motor response phases. Twelve healthy subjects [4 male, 8 female; mean age 30 years, standard deviation (SD) 10] were recruited. All subjects were right handed and had normal or corrected to normal vision . Inclusion criteria were: absence of mental or physical impairments and no history of psychoactive or psychotropic substance use (screened by an anamnesis and a clinical examination). Furthermore, subjects were not included if they had less than 6-8 h of sleep prior to the experiment and/or caffeine during the 48 h prior to the experiment. The entire experimental protocol was explained to all subjects who gave their signed consent before participating in this study. This study was approved by the Ethics Committee at the Federal University of Rio de Janeiro, Brazil. In order to minimize sensory interference, the experiment was performed in a sound and light-attenuated room. Participants were seated on a comfortable chair to minimize muscular artifacts while electroencephalography (EEG) data was collected. During the visual task, lights were turned off and subjects were instructed to concentrate exclusively on the monitor screen. A 15” Samsung monitor was placed 50 cm in front of the participant. The visual stimulus was presented on the monitor by the Imagery acquisition software, developed in DELPHI 5.0. In this paradigm, participants were asked to perform a task, actually in two conditions, real and imagery. Participants were instructed to respond to target stimuli by pressing a button with their right index finger. In real condition, participants must react to a stimulus (yellow square) with an index finger rhythmic movement (flexion-extension) using a mouse pad and an accelerometer in the index finger. In the imagery condition, participants must imagine the same task according to real conditions. They must perform a kinesthetic motor imagery, as if they were immersed in a mental video, watching the action performed by themselves and experiencing perceptions related to the task (first person perspective). Each participant received four blocks of 20 trials. 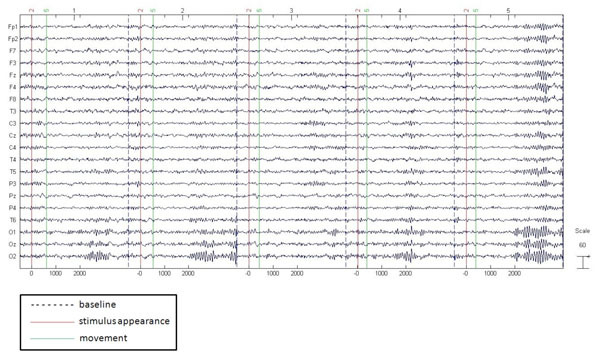 The task was performed simultaneously to EEG recording. The International 10/20 System for electrodes was used with a 20-channel EEG system (Braintech-3000, EMSA-Medical Instruments, Brazil) . The 20 electrodes were arranged in a nylon cap (Electro Cap Inc., Fairfax, VA, USA) yielding monopole derivations referred to linked earlobes. In addition, two 9 mm diameter electrodes were attached above and on the external corner of the right eye, in a bipolar electrode montage, for eye-movement (EOG) artifact monitoring. Impedance of EEG and EOG electrodes were kept under 5-10 kΩ. The data acquired had total amplitude of less than 100 µV. The EEG signal was amplified with a gain of 22,000, analogically filtered between 0.01 Hz (high-pass) and 50 Hz (low-pass), and sampled at 400 Hz. The software Imagery Acquisition (Delphi 5.0), was employed to filter the raw data: notch (60 Hz), high-pass of 0.3 Hz and low-pass of 25 Hz. The signal was analyzed in a time window of 6s, in order to verify the cortical mechanisms, before and after the task of flexion-extension of the right index finger. The time window comprised of -2s before to 4s after the event related to the task. For analysis purposes, we defined a time window in the range of -500ms before to 2.5s after the event (Fig. 1). Time window of EEG data processing. Representation of ERP topographic distribution, in the scalp, at the time window 382.5 ms between ME and MI conditions. A total of 960 epochs (12 subjects/80 epochs for each subject) was visually inspected in order to detect and eliminate epochs with muscle artifacts and electrodes showing impedance higher than 10 KΩ. Thus, 876 epochs remained for ME condition and 858 for MI. To quantify reference-free data, both visual inspection and independent component analysis (ICA) were applied to remove possible sources of artifacts produced by the task. Data from individual electrodes exhibiting loss of contact with the scalp or high impedances (>10 kΩ) were deleted as well as data from single-trial epochs exhibiting excessive movement artifact (±100 µV). ICA was then applied to identify and remove any remaining artifacts after the initial visual inspection. ICA is an information maximization algorithm that derives spatial filters by blind source separation of the EEG signals into temporally independent and spatially fixed components. 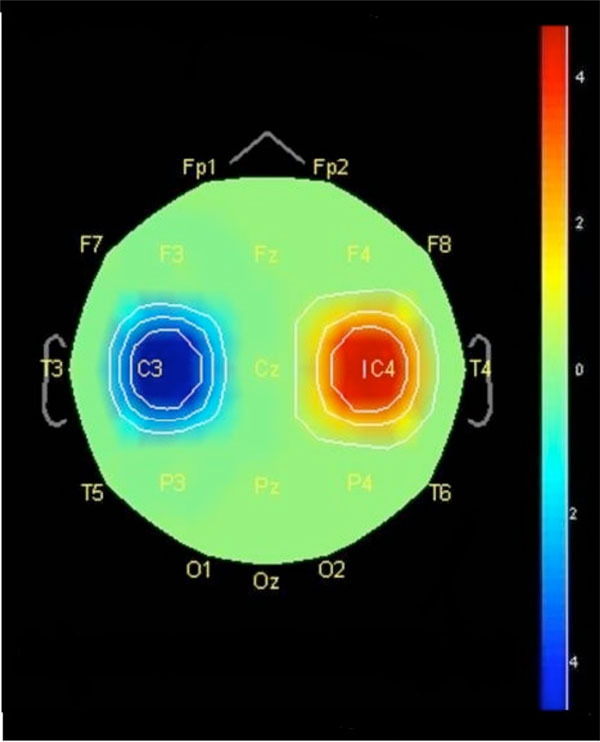 Independent components resembling eye-blink or muscle artifact were removed and the remaining components were then back-projected onto the scalp electrodes by multiplying the input data by the inverse matrix of the spatial filter coefficients derived from ICA using established procedures. The ICA-filtered data were then re-inspected for residual artifacts using the same rejection criteria described above. After using ICA to remove the remaining artifacts, no more epoch was deleted, remaining, therefore, 876 epochs for ME condition and 858 for MI condition. For statistical analysis, we used the software Brainstorm  to perform a paired t-test with multiple corrections by Bonferroni test within each condition, i.e., ME and MI, comparing baseline vs post-stimulus periods and an unpaired t-test with multiple corrections by Bonferroni test in order to comparing the conditions ME and MI (p ≤ 0.05). The time window chosen for analysis refers only to motor response phase (i.e., 382.5 ms), which was verified through the mean of reaction time measured by the accelerometer placed on the index finger of each subject. Exceptionally, we only found significant statistical difference between conditions in the motor response phase. When compared ME with MI condition, we found a statistically significant difference in favor of ME revealed by performing an unpaired t-test with multiple corrections (i.e., Bonferroni test; p = 0.05), demonstrating negative activity on electrode C3 and positive activity on the electrode C4 (Fig. 2). Fig. (2) shows the ERP topographical distribution in the scalp related to motor response phase between ME and MI condition. The aim of the study was to compare the topographical distribution of cortical activation through ERP in real and imagined movements. The existence of source generators located in the genesis of brain electrical activity associated with certain motor and cognitive processes is not a general property of ERP. It can be generated in a more focal or global manner, involving the participation of neural populations from different parts of the brain [16-18]. Thus, in certain cognitive processes such as those associated with motor response, a wide range of cortical areas or several brain regions can generate the potentials obtained in the scalp. As we expected, there were no significant statistical differences between conditions in motor preparation phase. Studies have shown that there are physiological similarities between ME and MI, with indications that both rely on the same process and share the same topographic distribution [3, 19-21]. The areas commonly activated are prefrontal, premotor and parietal cortices [5, 6]. The observation of Fig. (2) shows statistically significant differences between conditions only at time window 382.5 ms. When compared the ME and MI conditions, negative activity was observed in favor of the ME condition in the electrode C3, which represents the M1 contralateral to the hand used in the task, and positive activity in the electrode C4 that represents the M1 ipsilateral to the hand used in the task (Fig. 2). This negative activity can be interpreted as activation of the involved areas due to recruitment of neural networks, while positive activity can be understood as inhibition of involved areas due to the use of cortical resources. According to theory of Kotchoubey , the cycle of negativity-positivity is a comparison between the information of the areas activated during the sensorimotor preparation phase and the information of areas inhibited during the resolution phase, which suggests an information exchange of inhibited to activated areas. Therefore, it seems the human brain uses a neurophysiological mechanism that increases the focused activation of specific cortical areas and decreases activity in areas not relevant to task execution . This interpretation is similar to studies of event-related desynchronization and synchronization (ERD/ERS), even though the computational methods and data analysis were totally different. ERD means reduction of power in specific cortical areas, induced by an event, which reflect in increased cortical activity, while ERS on the contrary means increase of power in specific cortical areas, also induced by an event, which reflect in decreased cortical activity [21, 22]. Pfurtscheller  suggest that ERS expresses an inhibition or deactivation of neural networks involved in the task. ERS reflects the increase in cortical basal activity based on synchronized behavior of neural networks. In addition, Klimesh et al. have proposed that inhibition/activation process is relevant, because it allows memory resident in areas related to the task can be accessed. ERD expresses an activation of neural networks involved in the task, prepared to processing information with an increase in excitability of cortical neurons [22, 23]. This type of activity reflects a similar state of alert of neural networks in sensorimotor areas . In this process of activation and deactivation of areas, thalamic structures (interaction between thalamic nuclei and thalamic reticular nucleus) activate specific cortical areas at a certain time of the relevant information processing and deactivate others not used during the task execution . Such process could be interpreted as an electroencephalographic correlate of activated cortical areas involved in the sensory information processing and motor behavior production . This might indicate a participation of a broader neural network in the information processing . Therefore, it was revealed contralateral activation of M1 and supposed ipsilateral inhibition of M1, which is due to well known neurophysiological mechanisms and that may be explained by differences between conditions. The main difference is due to the fact that MI has no motor efference [1, 3-6]. Thus, according to Fig. (2), contralateral M1 showed a higher activation level. With regard to the positive activity found in the ipsilateral M1 (i.e., responsible for the movement of the opposite hand to the one used in the task), such activity seems to be a functional mechanism of inhibition, helping by sending information to consolidate the activation of neural networks of the M1 contralateral [21,22]. Moreover, this activity could be interpreted as if the brain were using a protective mechanism during the preparation of finger movement on the task, equivalent to inhibition of possible mirrored or involuntary movements of the left hand accompanying the voluntary actions of the right hand [27, 28]. A possible explanation is that, on the contrary to ME, the activity of the motor is subliminal in MI and insufficient to trigger the spinal motor neurons and therefore the efferent motor is blocked by an inhibitory mechanism generated in parallel to motor preparation before achieve the motor neurons [1-3, 29, 30]. MI works with a dual mechanism operating at the spinal level: increased activity of corticospinal tract, which implies a subliminal activation, and the presence of an inhibitory pathway in parallel avoiding the motor act . Furthermore, Pfurtscheller et al. argued that the sensorimotor system works as if blocked or inhibited by the lack of somestetic information processing or motor response, which agrees with our findings. Thus, as shown in Fig. (2), ipsilateral M1 seems to be activated during ME while no activity was found in MI. These results may be in agreement with Lapenta et al. tested whether transcranial direct current stimulation (tDCS) modifies mu rhythm oscillations during tasks involving observation and imagery of biological and non-biological movements . Analyses of C3 and C4 showed significant effects for biological vs. non-biological movement, and differential hemisphere effects according to the type of stimulation and type of movement. These differences may due because real steady-state locomotion seems to use a direct pathway via the primary motor cortex, whereas imagined modulatory locomotion an indirect pathway via a supplementary motor cortex and basal ganglia loop . On the other hands it is well known it has been hypothesized that the similarity between real and simulated actions depends on the nature of motor representations and training may improve the quality of imagery , thus another possibility is that subject were inexperienced of the movements in question and had not yet sufficiently developed mental maps in order to recall it properly in the imagination. Future studies must determine whether the training, with the improvement of imagery, can iron out the discrepancies between EEG in real movement or in imagery. The study also suggests the interest to measure the differences in the EEG in imagery of those disorders such as depression [34,35] and cognitive deficits [36-39] in which memory disorders have been described and for which has been found an improvement induced by exercise. In conclusion, we verified that there is a similarity regarding the topographical distribution of the activated areas, the occurrence of temporal activation and intensity during motor preparation phase. However, we found significant statistical differences for motor response phase when compared ME with MI. There are differences in the topographic distribution and intensity of activation between the conditions, but no differences in occurrence of temporal activation. These findings revealed similar functional connections established during ME and MI, suggesting that there is a common neural substrate shared by ME and MI, but also similar properties of functional integration [1-3]. Often, stroke patients cannot perform any type of movement in the early phase of recovery (acute phase), and the use of MI plays an important role to keep certain neural networks active, even without any overt motor output. Thus, our findings would be useful to implement programs of neurorehabilitation or even the creation of new methods of rehabilitation combining different techniques, such as MI-related activities of daily living [5, 6]. We recommend, therefore, further investigations using other types of conditions, e.g., the comparison of simple and complex movements, not only in the ME and MI, but also in a motor observation condition (i.e., mirror neurons), in order to covering more depth the issue of motor representation in cerebral cortex. Jeannerod M. The representing brain neural correlates of motor intention and imagery Brain Behav Sci 1994; 17: 187-245. Jeannerod M. Mental imagery in the motor context Neuropsychologia 1995; 33: 1419-32. Jeannerod M. Neural simulation of action a unifying mechanism for motor cognition NeuroImage 2001; 14: 103-9. Decety J, Grezes J. Neural mechanisms subserving the perception of human actions Trends Cogn Sci 1999; 3: 172-8. Jackson PL, Doyon J, Richards CL, Malouin F. Potential role of mental practice using motor imagery in neurological rehabilitation Arch Phys Med Rehabil 2001; 82: 1133-41. Lotze M, Cohen LG. Volition and imagery in neurorehabilitation Cogn Behav Neurol 2006; 19: 135-40. Munzert J, Zentgraf K. Motor imagery and its implications for understanding the motor system Prog Brain Res 2009; 174: 219-9. Guillot A, DiRienzo F, Macintyre T, Moran A, Collet C. imagining is not doing but involves specific motor commands.A review of experimental data related to motor inhibition Front Hum Neurosci 2012; 6: 247. Kotchoubey B. Event-related potentials cognition and behavior.A biological approach Neurosci Behav Rev 2006; 30: 42-65. Polich J. Updating P300 an integrative theory of P3a and P3b Clin Neurophysiol 2007; 118: 2128-48. Rossini PM, Rossi S, Babiloni C, Polich J. Clinical neurophysiology of aging brain from normal aging to neurodegeneration Prog Neurobiol 2007; 83: 375-400. Wang L, Kuroiwa Y, Li M, Wang J, Kamitani T. Do P1 and N1 evoked by the ERP task reflect primary visual processing in Parkinson's disease Doc Ophthalmol 2001; 102: 83-93. Oldfield RC. The assessment and analysis of handedness the Edinburgh inventory Neuropsychologia 1971; 9: 97-113. Jasper H. The ten-twenty electrode system of the international federation EEG Clin Neurophysiol 1958; 10: 371-5. Tadel F, Baillet S, Mosher JC, Pantazis D, Leahy RM. Brainstorm a user-friendly application for MEG/EEG analysis Comput Intell Neurosci 2011; 2011: 879716. Bressler SL, Coppola R, Nakamura R. Episodic multiregional cortical coherence at multiple frequencies during visual task performance Nature 1993; 366: 153-6. Bressler SL. Large scale cortical networks and cognition Brain Res Rev 1995; 20: 288-304. Nunez PL. Toward a quantitative description of large-scale neocortical dynamics function and EEG Behav Brain Sci 2000; 23: 371-437. Bakker M, deLange FP, Helmich RC, Scheeringa R, Bloem BR, Toni I. Cerebral correlates of motor imagery of normal and precision gait Neuroimage 2008; 41: 998-1010. Iseki K, Hanakawa T, Shinozaki J, Nankaku M, Fukuyama H. Neural mechanisms involved in mental imagery and observation of gait Neuroimage 2008; 41: 1021-31. Neuper C, Pfurtscheller G. Event-related dynamics of cortical rhythms frequency specific features and functional correlates Int J Psychophysiol 2001; 43: 41-58. Pfurtscheller G. Functional brain imaging based on ERD/ERS Vis Res 2001; 41: 1257-60. Klimesh W, Freunberger R, Sauseng P, Gruber W. A short review of slow phase synchronization and memory evidence for control processes in different memory systems Brain Res 2008; 1235: 31-44. Pfurtscheller G, Lopes da, Silva FH, Eds., et al. Event related dynamics of alpha band rhythms a neuronal network model of focal ERD/surround ERS In Event-Related Desynchronization Handbook of electroencephalography and clinical neurophysiology . revised edition.. Amsterdam Elsevier. 1999; vol. 6.: pp. 67-85. Pfurtscheller G, Klimesh W. Functional topography during a visuoverbal judgement task studied with event-related desynchronization mapping J Clin Neurophysiol 1992; 9: 120-31. Dujardin K, Derambure P, Defebvre L, Bourriez JL, Jacquesson JM, Guieu JD. Evaluation of event-related desynchronization (ERD) during a recognition task effect of attention Electroenceph Clin Neurophysiol 1993; 86: 353-6. Duque J, Mazzocchio R, Dambrosia J, Murase R, Olivier E, Cohen LG. Kinematically specific interhemispheric inhibition operating in the process of generation of a voluntary movement Cereb Cortex 2005; 15: 588-93. Serrien DJ, Ivry RB, Swinnen SP. Dynamics of hemispheric specialization and integration in the context of motor control Nat Rev Neurosci 2006; 7: 160-6. Caldara R, Deiber MP, Andrey C, Michel CM, Thut G, Hauert CA. Actual and mental motor preparation and execution.A spatiotemporal ERP study Exp Brain Res 2004; 159: 389-99. Yue G, Cole JK. Strength increases from the motor program comparison of training with maximal voluntary and imagined muscle contractions J Neurophysiol 1992; 67: 1114-23. Carta MG, Hardoy MC, Pilu A, et al. Improving physical quality of life with group physical activity in the adjunctive treatment of major depressive disorder Clin Pract Epidemol Ment Health 2008; 4: 1. Hardoy MC, Seruis ML, Floris F, et al. Benefits of exercise with mini tennis in intellectual disabilities effects on body image and psychopathology Clin Pract Epidemiol Ment Health 2011; 7: 157-60. Lapenta OM, Minati L, Fregni F, Boggio PS. Je pense donc je fais transcranial direct current stimulation modulates brain oscillations associated with motor imagery and movement observation Front Human Neurosci 2013; 7: 256.
 laFougère C, Zwergal A, Rominger A, et al. Real versus imagined locomotion a [18F]-FDG PET-fMRI comparison Neuroimage 2010; 50(4): 1589-98. Mura G, Carta MG. Physical Activity in Depressed Elderly.A Systematic Review Clin Pract Epidemiol Ment Health 2013; 9: 125-35. Olsson CJ, Nyberg L. Brain simulation of action may be grounded in physical experience Neurocase 2011; 17(6): 501-. Vieira RT, Caixeta L, Machado S, et al. Epidemiology of early-onset dementia a review of the literature Clin Pract Epidemol Ment Health 2013; 9: 88-95. Bukh JD, Bock C, Vinberg M, Gether U, Kessing LV. Differences betweeldult depression Clin Pract Epidemiol Ment Health 2011; 7: 140-7.